Sure wish I was not banned from attending NKT events. For what, I still do not know. A while back, I got a call from an NKT monk who told me I could not attend NKT events and the $20 I had paid for an NKT event would be returned. Banning me sooner would have saved me thousands of dollars and substantial volunteer time. Because, Dekyong is in a town nearby, Sarasota, Florida, for 3 events this week. 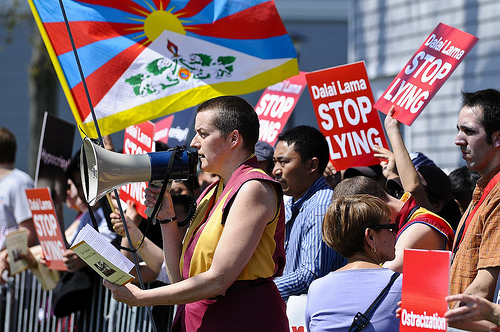 I understand this is where Dekyong explained why Lucy James, the center's highly regarded resident teacher, had been fired by Kelsang Gyatso for not supplying troops for his protests against the Dalai Lama. Since, Dekyong climbed the ladder to become NKT's leader, replacing the more or less retired Kelsang Gyatso. Might have been an awesome experience, hearing her talk about love, Kadampa Buddhism and pure confidence, which I have been unable to find in NKT's public attacks against many Tibetan Lamas and NKT survivors. The center's announcement for the event says, "Please feel free to attend, Everyone is Welcome." False. Every once in a while, I drive by the center. The sign says, "Everyone Welcome." False. From NKT's ban of many from its centers and lots of research, I have concluded that most of what NKT says is false. Because of NKT's ban against me, I will not get a direct chance to learn otherwise. Sure wish I could have chatted with Dekyong.